Gone are the days when word of mouth and other traditional marketing methods were all it took to attract new patients to your clinic. Now, if you want to get ahead of your competition, you need to be thinking about your online presence. These days, the most successful marketing takes place online. Therefore, you need to use your website as a platform to portray your clinic in the best light possible. Do this through the use of high quality website designs that provide in-depth information for your patients. Here are some of the things you can do to create an amazing website that brings patients to your clinic. Check out your competitors’ websites. This can provide you with some excellent ideas on what to do and what not to do when it comes to creating your own website. Moreover, be sure to go in with an open mind. There’s always the chance that patients couldn’t care less about the information you think is important. For example, you might think it’s important for people visiting your clinic to know the background behind your clinic’s name. However, all they probably want to know are the clinic’s hours and its parking costs. Further, checking out your competition—both locally and internationally—will give you some idea of successful design. In general, less-cluttered websites with lots of white space perform better than those with lots of text. The Americans with Disabilities Act (ADA) is legislation that protects disabled people from discrimination. Moreover, this legislation applies to online content as well as physical access to buildings and other concerns. This means that you must make adjustments to ensure that those with disabilities such as visual or hearing impairments have full access to your website. Surprisingly, lots of websites are taking their chances with these requirements—some without even realizing it. As a clinic looking to attract patients, however, some of whom will probably be disabled, you cannot afford to take this risk. If you do, you may find your company being one of thousands that are sued for ADA non-compliance every year. What’s more, you could potentially lose out on hundreds of patients. Make sure your website is completely accessible by keyboard ONLY. Offer text-based alternatives to any interactive media, including images and video. Provide in-depth instructions for any interactive part of your website. For instance, simply listing “error” is not enough. 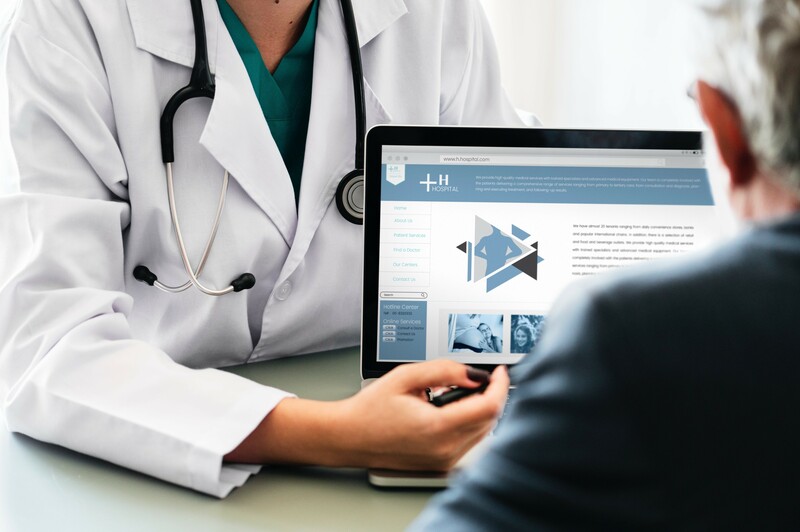 A surprising number of websites in the healthcare industry have paid little attention to ensuring their websites perform well on mobile devices. However, you need to consider that more than 50% of all web browsing content takes place on mobile devices. Therefore, you could be missing out on a large number of patients who don’t visit your clinic’s website because they can’t easily access it on their phones. The good news is that a good website designer will make your website mobile-friendly for you. Another reason to think about optimizing your website for mobile is that it can help with your Google search ranking, as well as your SEO overall. Of course, your primary aim as a clinic in the healthcare industry will be to treat patients. However, you also have a responsibility to sell your services so that your clinic remains in business. According to Digital Authority Partners, businesses have used data visualization for quite some time. Recently, however, this technique has since made its way into the consumer space as well. In healthcare, data visualization makes complex information easy to digest. In other words, viewers can understand data independently. Your data might include statistics that represent successful parts of your company. You could also use data visualization to provide future patients with feedback from current customers. In short, the main aim of this technique is to attract customers to your clinic by proving that you are a better choice than your competitors.